If you ever wanted to know how people are storing or sharing content on the web, this graph says this all. It shows a list of most popular social services that are used by netizens to share or save web pages. Email continues to be the most favorite mode for sharing links on the Internet followed by Facebook and Digg though its a formidable lead. 1. More people prefer sharing links on social networking sites like Facebook or MySpace rather than the regular social bookmarking services like delicious. 2. 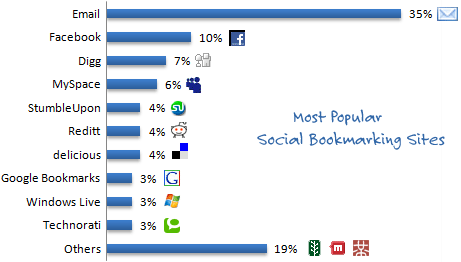 Windows Live is gaining ground and appears almost as popular as Google Bookmarks. The gap was very wide last year. 3. Don�t discount Technorati yet. It looks like lot of people do add blogs / websites to their "Technorati Favorites" and it�s more popular than say Diigo, ma.gnolia.com or Mixx.com.